Take a good look at the lunch I made over the weekend. Isn’t she beautiful? Best part is… it only took me 5 minutes to prepare from start to finish. I have no problem admitting that I like cooking food in the microwave. It is an essential kitchen appliance I use multiple times throughout the day from heating up hot water for tea to steaming left over frozen rice for a quick meal. I like the convenience it offers as well as the reduced cooking times, especially when I’m cooking just for myself. Today I’m going to teach you how to cook tender, flaky salmon in the microwave in less than 5 minutes for a single portion fillet. 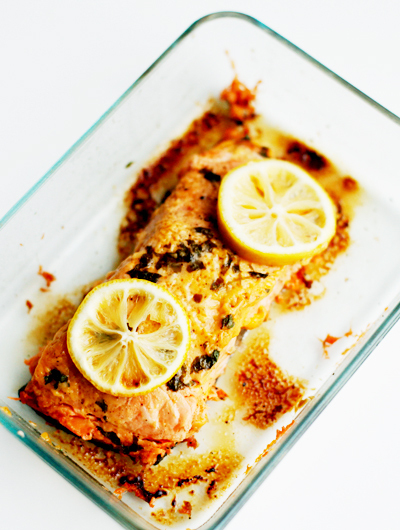 It’s a fabulous way to prepare salmon quickly without any fuss. So let’s get started. You will want to rinse the salmon and pat it dry. Season the fish with salt and pepper. 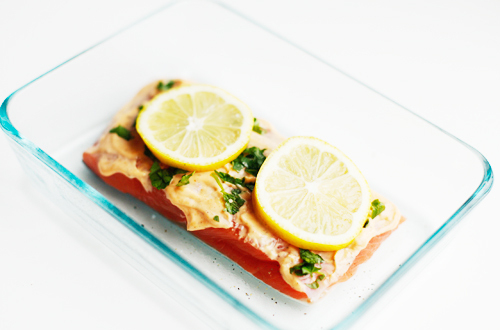 Place the salmon in a microwave safe dish and tightly cover it with plastic wrap. Microwave the salmon for 3.5 minutes. Pierce the fish with a fork in the center to check if the salmon is cooked through. If there is no bright flesh in the center, the salmon is ready to eat. If there is uncooked fish left, cook for an additional 30-45 seconds before checking again. Instead of seasoning it with just salt and pepper, what I like to do is spread a thin layer of either mayonnaise or a spicy sriracha blend. I’ll also add a few lemon slices and a sprinkling of fresh parsley too. 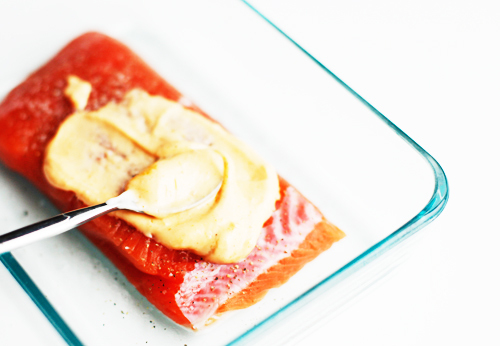 It helps keep the salmon very moist not to mention giving it a burst of bright flavor. 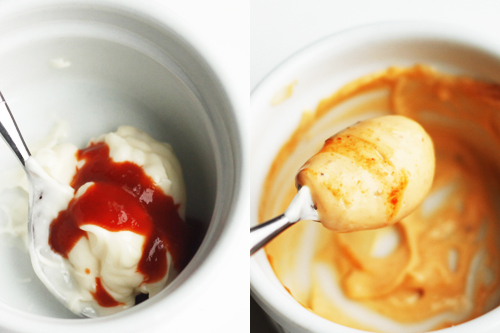 Sriracha mayonnaise is easy to make is can be used anytime a recipe calls for regular mayonnaise. It adds a nice heat to savory meals and also works as a spicy dip. Sriracha can be found in Asian grocery stores or in the Asian section of your local grocery store. 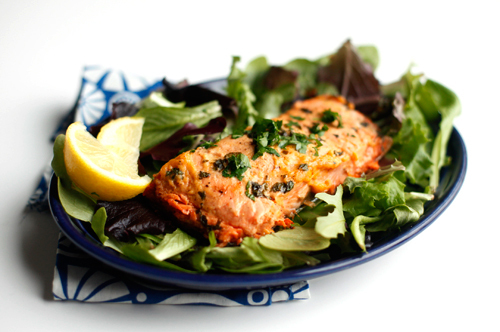 Here’s a recipe for Spicy Salmon cooked in the microwave. Enjoy! A quick recipe for spicy salmon using the microwave. Rinse salmon filet with cold water and pat dry. Place the salmon skin side down in a microwave save container. Season the salmon with salt and pepper. Set aside. In a small bowl, combine mayonnaise and sriracha sauce. Generously spread the mayonnaise mixture on top of the fillet. Add lemon slices and parsley. Cover the dish tightly with microwave safe plastic wrap. Microwave the fish for 3.5 minutes. Check the center of the filet for doneness with a fork. If there is any uncooked fish, microwave for another 30-45 seconds. 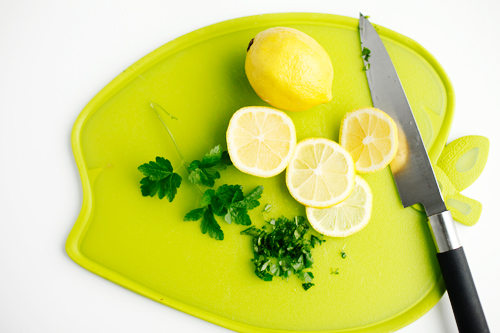 Garnish with additional parsley and lemon wedges. Disclosure: Salmon was gifted to me by Norwegian Salmon in partnership with a Martha’s Circle campaign. My kids favorite way to eat salmon is with teriyaki sauce on it. So glad your grandson liked it! Thanks for stopping by. Oh my goodness this was so good! My 8 yr old grandson said he did not believe he would ever eat salmon without upchucking! I used teriyaki sauce, cause I really like that flavor. Can i make some variations from your recipe by using other types of veggies (like zucchini, spinach, tomatoes, bell pepper)? If yes, what should i do and shouldn’t do to make that dish perfect? 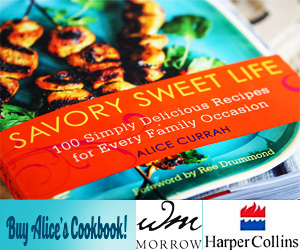 Thank you Alice for sharing this recipe and for adding your additional notes. I cooked salmon in the microwave tonight for the first time, with the mayo and a mild curry powder topping and it was delicious. I served it on fresh pasta with mushrooms and peas. The best thing about the recipe was that the salmon did not dry out but also it was so quick to do….five minutes at the most from start to finish. I cooked each piece of fish in a plastic take away container and put the lid on without completely sealing it. That prevented the fishy smell, mentioned in the posts above from leaking out. Do you have other fast microwave recipes on line? Thank you May for stopping by. I am so glad this recipe is helpful to you given where you live! I’ve been switching over to plain Greek yogurt as well this last year and I find adding a little vinegar or lemon adds a nice acidic quality to it, like mayo. You can also try adding miso paste or curry powder to your yogurt for a different healthy variation. I rarely cook because I live in a small NYC studio apartment and the smell from cooking lingers for a few days. I thought that my only options to eat at home were making salads and sandwiches or getting a takeout, until I discovered how to cook using microwaves, which produced minimal odor. This was the first fish dish I made using a microwave, and boy, was it delicious. I am a foodie who love to eat out but the salmon came out so perfectly moist with just the right amount of flavor that I am looking forward to cooking more from now on. I modified the recipe slightly by substituting plain Greek yogurt for mayo to cut the fat and sukiyaki sauce instead of siracha to make it a more mild flavored salmon. 3.5 minutes later, the most perfect salmon came out. Thank you for this recipe! This recipe is awesome!!! I love having warm food for lunch at work, but usually end up with something unhealthy covered in cheese. But this recipe is great! It is filling and tasty, but healthy! It only takes 3 mins for the thin store-bought salmon I’ve been using. I mix the sriracha and mayo on top of the salmon because I don’t like dirtying another dish, and I left the parsley off because I didn’t have any, but it was still delicious! Amazing recipe, can’t thank you enough! Brilliant recipe! I have just got my children eating salmon, I am sure this will go down a treat. Many Thanks! Thanks. I tried it and it was surprisingly delicious! I don’t remember salmon tasting that good by broiling or baking it before. I put a little peso sauce on mine as I love the taste of salmon and pesto together. I always cook microwave salmon, covered, on the defrost cycle. On my machine that is 30% power. On full power the fish would sputter and kind of explode so one day while defrosting frozen salmon fillets I decided to try to cook it more slowly. It takes more time but I feel gives a better looking result. Wish I had a cook time to give you but I’ve never actually timed it. After the first half pound defrost cycle for two fillets I play it by ear, entering less weight so I have less chance of over cooking. Great recipe Alice!!! I’ve been microwaving salmon for years, and my family loves it! It’s fast and stays moist. I cook it in a square microwaveable-bowl. I squeeze it in tight and spread a layer of mayo on top, than add salt and pepper and lots of different spices, thinly sliced almonds and different seeds. Than I drench the topping in lemon juice, add a few tablespoons of butter on top, and cook it for anywhere from 6 to 12 min, depending on the thickness. If the bowl is hot to touch, it close to ready. YES! Fish microwaves very well. I eat salmon several times a week and always microwave it. Same with tuna, swordfish, tilapia, etc. I don’t add salt but do use pepper and sometimes dill weed. Sliced lemon is great on chicken but I avoid using lemon or lemon juice on fish because I don’t like to overpower the flavor of the fish. Most people are aware that microwaving is quick and easy, but it’s also an excellent way to prepare many foods, especially fish. Thanks, I’ll try that! Wondering how would you go about microwaving frozen salmon filets instead of fresh? Im going to try this tonight.. But in a microwave safe glass dish with cover. Please don’t ever use plastic wrap in the microwave or any other form of plastic it releases harmful chemicals. Thanks for the recipe! I will need to try your recipe as is. But today, I microwaved the salmon using a sprinkle of salt, pepper, honey, and a little butter — because my kiddo is allergic to eggs, garlic, and a slew of other things. I microwaved it for 3 minutes and it was perfectly moist and quick! Loved that. The rest of the family had sushi casserole with the crab, mayo, and sriacha, so, again, since I have the ingredients at hand, will need to make your recipe as is! Sounds delish! Thanks for the microwave cooking idea! Saved me a whole lot of time and produced moist salmon! Thanks so much Alice! My family is living in a hotel right now but I still want to cook real meals. Found this recipe and was super excited! I didn’t have any mayo on hand so modified it with softened cream cheese, tumeric and dill. Super yum! Thanks for sharing! You will want to rinse the salmon and pat it dry. Season the fish with salt and pepper. This is an excellent idea and post. Your photos are excellent and the steps are very thorough and easy to follow. Thanks again for the great meal idea. I am headed down to the kitchen to make it right now. I just made this tonight! I had never made salmon in the microwave before and was so surprised at how good it turned out! Everything was super moist and tender – will definitely make again. Thank you for such easy recipes!